The congregation that began at 11.30 am continued till 5 pm and was marked by the recitations of Holy Gurbani keertans and Kathas (holy hymns). Sikhs taking part in the Khalsa Panth Foundation Day procession in the city on Sunday. Hyderabad: Khalsa Panth Foundation Day (Vaisakhi) was celebrated on a grand scale by the members of the Sikh community with gaiety and devotion at Gurudwara Saheb Ameerpet on Sunday. 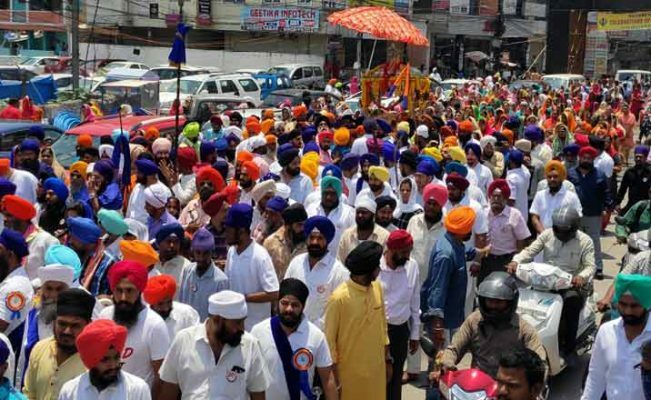 Over 25,000 Sikh devotees and other community faiths participated in the ‘Vishaal Deewan’ (Mass congregation) organised under the aegis of the Prabhandak Committee Gurudwara Saheb Ameerpet. The congregation that began at 11.30 am continued till 5 pm and was marked by the recitations of Holy Gurbani keertans and Kathas (holy hymns). The preachers called upon the devotees to follow the teachings of Guru Granth Sahebji, which stand for national integration, communal harmony, brotherhood and peace to the whole humanity. Organisers said in the evening, a colourful ‘Nagar Keertan’ (Holy procession) was taken out from Gurudwara Saheb Ameerpet. It passed through Greenlands, Begumpet and Punjagutta before returning back to Gurudwara Saheb Ameerpet. Guru Granth Sahebji was carried on a decorated vehicle along with five ‘Nishaan saheban’ during the procession. Shabad keertans were rendered by the Keerthani jathas of men, women and youth groups while Sikh youth displayed ‘Gatka’.